From light festivals to yule goats, to stockings — or shoes — stuffed with surprises, Christmas traditions figure prominently around the world. In my family, holidays are marked by food we’ve looked forward to all year long. Menus of treasured traditions are customary for many. 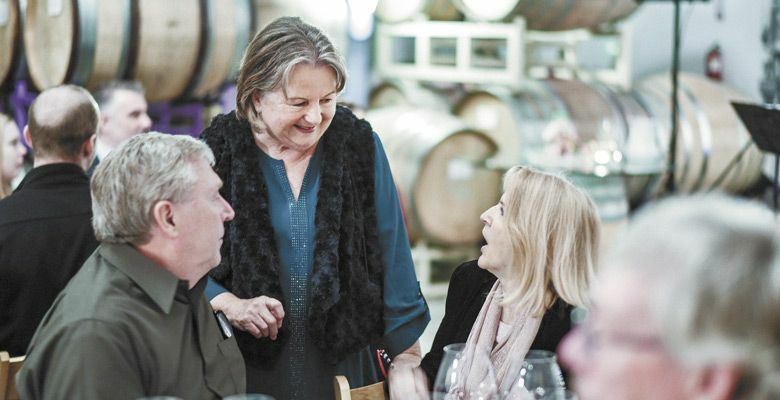 For Craig and Gabriele Keeler of Keeler Estate Vineyard in Amity, the table takes center stage. German dishes star alongside the warmest hospitality, festive decorations and a selection of wine that would make Santa and all the elves toasty and likely off schedule. The Keelers first hosted their now annual German Christmas Dinner with friends in 2015. The dinners are inspired by Gabriele’s fond childhood memories of Christmas after the war in her hometown of Bremen in Northern Germany. Times were tough in those days. There was not a lot of money or resources, so practical items, straw ornaments, apples, Mandarin oranges and nuts, became Christmas decorations. Gabriele recalls, “We used what we had or what we could easily make. My mother always said, ‘And when Christmas is all done and over, we can eat the apples.’ They were a necessity in disguise.” She says they enjoyed many baked apples over the winter. 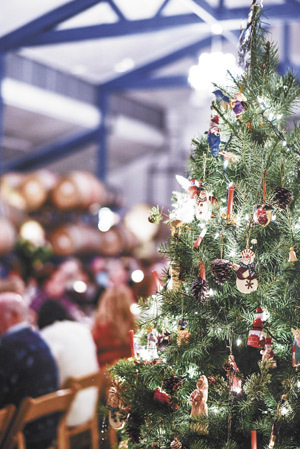 The Keelers continue to honor those traditions, transforming their winery into a celebration of Christmas past. Instead of hanging expensive and fragile glass ornaments, she dresses the beautifully lit trees with wooden ornaments collected as a young girl, as well as bright red apples that add an organic element and punches of color to the otherwise dim cellar — still fragrant with the smells of harvest. In Germany, a very common sight remains the Advent wreath, a Christian tradition that marks the passage of the four Sundays leading to Christmas. On the fourth and final Sunday before Christmas, all the candles are lit. Gabriele’s family has always created the wreath at home with greenery and small decorations. She laughs at the story now, but recalls, “We used real candles on our Christmas tree every year, but after the Advent wreath caught fire one year, our mother, undeterred, would keep two buckets of water nearby, just in case.” Brave and equally undaunted, Gabriele still uses genuine candles on her trees. 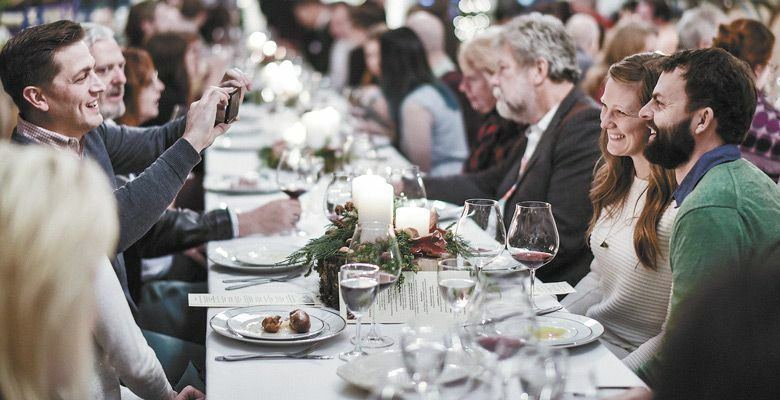 Last year, the Keelers partnered with Chef Yuriy Chira of Chira’s in Salem for a festive celebration of fine German fare and Keeler wine. Some of the dishes included: Kartoffelsuppe, a traditional German potato soup with Black Forest ham; Herring Salat, a pickled herring salad; Geschmorte Kotletten und Würstchen mit Sauerkraut, a 12-ounce pork chop braised with German sausage, sauerkraut and golden potatoes; Rouladen, filet mignon roulade with pickles in a beef demi-glace with house-prepared horseradish; Geröstetes Gemüse, roasted winter vegetables; Gefülltes Käsebrot, bread stuffed with beer cheese; and Schokoladenkuchen mit Beeren und Sahne, a German chocolate cake with Marionberries and cream served with a secret Santa cocktail — which is still a secret. Along with food and wine, gingerbread houses too beautiful to eat are also part of the Keeler Christmas dinner. A German tradition since the 16th century, the houses (at last year’s event) were made by local artist Mike Bittle and his wife, Renée, of RMB Craft Bakery in McMinnville. 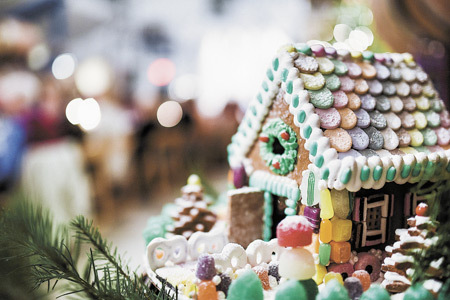 “Growing up, we would bake the gingerbread and then make homemade houses,” Gabrielle says. “It was one of my favorite activities to do during Christmas. We would decorate the houses and use some of them as gifts. The houses would last a long time.” Last year, a handful of guests took a bit of the Keeler Christmas magic home after winning one of the spectacular masterpieces. Yet, in addition to the lucky winners, everybody who attends the annual event wins in the end. 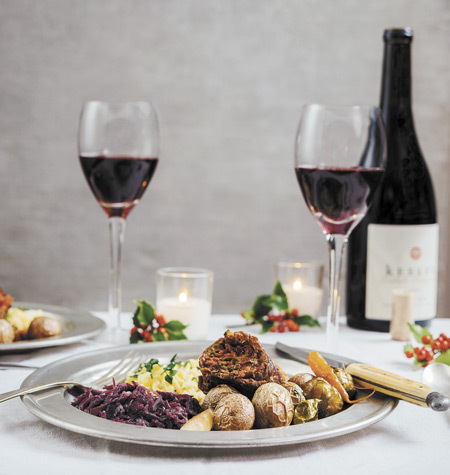 Fine German fare and Keeler wine with warm memories of the evening linger for days. This year will be no different — check the mouthwatering sidebar for this year’s menu. Tickets are $125 exclusively for our wine club members. Each guest will receive a bottle of our new 2017 Late Harvest Pinot Gris to take home. Limited seating available, this event will sell out. 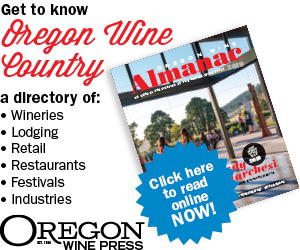 Purchase online, keelerestatevineyard.com, or by phone at 503-687-2618. Due to the nature of this event refunds are not available for cancellations, however if you’d like to transfer your seats to a friend, please give us a call.